Can a documentary have measurable impact? YES! Often the best part of the story starts with collective action after the film is released. The Rise of the Eco-Warriors (REW) Impact Report is a dynamic data visualization and case study reporting on the remarkable global impacts of this vibrant story eco-system. 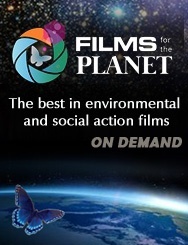 The film, TV series and ground-breaking educational curriculum are exemplary -- inspiring a movement that is ideally positioned to replicate solutions and help turn the tide on climate inaction. Through this colorful data visualization, one sees how the rules for documentary making have dramatically changed. Effective storytelling in the digital age has become an expansive architecture that disrupts convention, mobilizes passion, engages stakeholders and inspires community. This case study informs readers on innovative approaches to 21st century storytelling that are essential for creating systemic change and moving fresh ideas forward. Rise of the Eco-Warriors (REW) is a story of courageous individuals willing to take action to avert environmental disaster and help bring humanity into balance with the natural world. They realize that every individual matters, every action counts. Compathos became part of the REW adventure by harvesting three years of viewer engagement data which translated into a spectrum of solution-based impacts. Measurable impacts included student led, philanthropic, P2P crowdfunding, educational, community based and entrepreneurial initiatives. Engagement activities included social media as well as traditional metrics for viewership through theatrical release, community and educational screenings, festivals, on demand viewings, and REW television series. The project began in 2010 with a call from Microsoft Partners in Learning which had just conducted an online poll with tens of thousands of school students from the Asia Pacific region. Originally involving 12 schools and 90 students who had participated in Microsoft's Regional Innovative Education Forum in Singapore, the project's foundation was based on the simple question: "What is our most pressing global issue?" To that, both students and teachers agreed: deforestation. Through the campaign, we learn how a group of young people and millions of online supporters learn what it takes to stop deforestation and save Planet Earth. As the story unfolds, we become aware of the enormity of the problem and that through our personal decisions and collective action, we can make a difference. Viewers learn about the connection between the over-consumption of palm oil and the devastating environmental and social consequences of deforestation. They explore solutions through the work of world-renowned forest innovator and educator, Dr. Willie Smits, whose regenerative and revolutionary interventions hold the keys to positive change in the face of run-away deforestation and climate change. As "Earth Watchers", students engage with revolutionary action-based learning resources using a satellite monitoring system to detect illegal disturbances in the rainforest. The evolution of this story continues to evoke action and provide memorable learning experiences through audience led initiatives. These ongoing activities help shape globally conscious behaviors such as responsible consumerism, philanthropic investing and social entrepreneurship, The projects continue to play important roles in policy change, wildlife rescue and rehabilitation, reforestation, and regenerative bio-diversity and eco-travel programs in collaboration with local communities. Impact reports such as these can inform media producers, system architects and impact investors wishing to achieve whole system impacts that create cultural traction while engaging multiple stakeholders and generating new market opportunities.